Wandering around Warren County recently, we somehow ended up on Pequest Road, behind the Pequest Fish Hatchery. There are a few houses and whatnot, but largely it's a quiet, wooded area. That's why we were surprised to find a well-mowed grassy area at the corner of Pequest Road and Oxford Road. It appeared unoccupied, but for an obelisk in the center. Maybe it was a memorial of some kind? We got out to take a look, and the obelisk itself seemed to be on a somewhat precarious perch of stones beneath it. 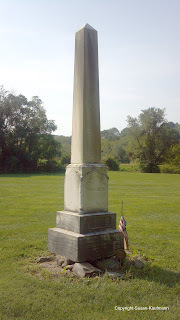 The name "Henry Nagle" was prominently inscribed, with the years 1851-1899, and a small American flag was perched alongside. What made him so important that he had this big field to himself? And was this a grave marker, or just a tribute? I had to look further. One by one, I stopped at each depression to find a white stone beneath. Some were largely overtaken by the turf and dried grass clippings around them, but others were mostly readable. Each had a name and a date of death, mostly in the 1930s. This was a cemetery, for sure, but why were the markers embedded at ground level, and why did they seem obscured even though the place was obviously cared for to some degree? And why were all of the death dates in the depths of the Great Depression? Had there been some sort of contagion? Was there insufficient food and mass starvation? There was nothing to guide me to a plausible theory, not even a sign naming the graveyard. It was a case for the internet. The mystery was solved pretty quickly. According to Find a Grave, Spanish American war veteran Henry Nagle donated the cemetery land so the county's less fortunate would have a decent resting place. The graves I'd found were those of former residents of the Warren County Alms House, a facility that had housed the local indigent. Thing was, there was no building nearby that was large enough to have been the county poor house, even for an area like Warren that had probably not been that populated back in the day. About a half hour later, in our continued wandering, we actually stumbled upon it without realizing. Following Pequest Road and then making a few turns, we saw signs pointing to Warren Haven and decided to follow them, reaching the county senior home. Nearby was an impressively restored early 1800s stone building which is now the headquarters of the county health department. What I didn't find out until later was that for most of its life, it served as the county almshouse. All of those folks whose graves I'd found had once lived in that large stone house. Sometimes it's odd when we accidentally discover related places when we're just wandering around. I wonder sometimes whether there's something guiding us, or whether it's just dumb luck. This is one of those times. A cup of tea with Washington?